Discover our elegant Chocolate-Beige Leatherette Display collection and showcase your pieces in style! 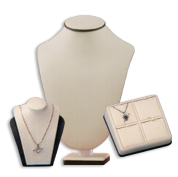 You'll find many types of articles, perfect for rings, earrings, necklaces, rings and more. Get busts, stands & pillows for your precious items, all at affordable discount prices thanks to our wholesale offers!